" Ruda Holiday Park has it all! Golden sands on an award winning blue flag beach, Croyde Bay, world-class surf and outstanding park facilities all set in the charming hamlet and picture postcard village of Croyde, an ideal location for you family holiday. " "For Last minute and late availability holidays. Call us today on 0871 641 0191 for details of any current offers!" Email: enquiries@parkdeanholidays.co.uk Tel: 0871 641 0191 (statics)Tel: 01271 890477 (touring) Fax: 0191 2685986 quoting Beautiful Devon"
Ruda Holiday Park offers customers a wide selection of superb holiday homes including, caravans, timber lodges, beachside apartments and there’s even a house and cottage. Details of Accommodation at Ruda Holiday Park. Caravan Holiday Homes: 3 bedroom, sleeps 6-8. 2 bedroom, sleeps 4-6. 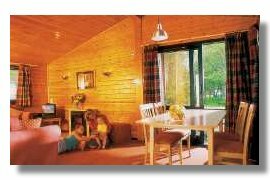 Lodges and Apartments: 3 bedroom, sleeps 6-8. Lundy Cottage: 3 bedroom, sleeps up to 6. Lundy House: 6 bedroom, sleeps up to 13. Visit www.parkdeanholidays.co.uk to check availability, view our tariff and to book online. Please contact us for details of short break offers. Thank you. Entertainment for the Kids at Ruda Holiday Park Kids will love joining in the fun with Maxi, Multi and Milli in their own childrens club, with dancing, competitions, games and much more! With a fun packed programme of daytime and evening entertainment that will keep you amused all week long. Croyde Bay Ruda's fantastic award winning beach is a firm favourite with surfers young and old, playing host to major surfing competitions and events every year. 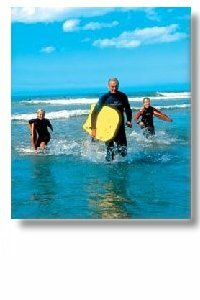 This up and coming sport is open to all ages and with expert tuition from Surf South West, regular lifeguard patrols (during peak periods) and wetsuit/surfboard hire all down on the beach, you too can ride the famous Croyde Bay surf! For those simply wanting to relax, there's a great Beach Cafe or why not hire a deckchair and soak up the glorious North Devon sun? Cascades Indoor Tropical Adventure Pool is a firm family favourite, with a giant 230ft flume, fun rapids ride, bubble lounger, jacuzzi and toddlers' pool, there's something for the whole family to enjoy (Small entry charge applies. Save money by buying 'saver tickets' when booking). If that's not enough to wet your appetite, then why not try your hand at mountain boarding, horse riding, tennis or cycling, which can all be booked on the park? Budding fishermen can even try a spot of angling in one of the park's well-stocked ponds. Touring & Camping at Ruda The generously sized, numbered pitches are appreciated by both campers, motor-home and touring caravan owners alike, the Newly refurbished touring blocks are close by for your convenience along with launderette, supermarket and other facilities. Exmoor Zoological Park Combe Martin Wildlife & Dinosaur Park- Set in twenty five acres of beautiful woods and parkland, is the perfect family day out, with over 250 species of wildlife to discover, cascading waterfalls, sub tropical plants and tropical birds! Watermouth Castle is a family theme park full of attractions to keep you entertained all day long. Clovelly.This ancient fishing village is mentioned in the Doomsday book. Visit it now and you can still experience the tranquil pace of life of two hundred years ago - it will leave you with lifetime memories. "Luxury holiday parks in North Devon"